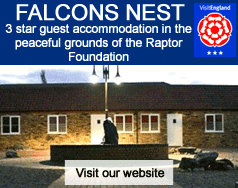 This half day experience is the ideal gift for lovers of birds and the countryside. You can enjoy the pleasure of flying one of our hawks in a natural environment. You will be greeted on arrival and taken for tea or coffee. You will then be introduced to your falconer who will give you a brief safety talk. When ready you will be introduced to the bird that you will be taking on the walk. Then you will be given basic instructions on how to handle the bird and how to entice it back to the glove. Your walk will then commence with a leisurely stroll in the local countryside watching the bird do what comes naturally. This may include chasing prey and watching the thrill and speed of the hunt. On returning to the centre you will have a photo taken of you holding the bird you had your experience with. Hawk Walks are not suitable for wheel chair users although we can offer alternative experiences such as Meet The Birds and Falconry Experience Day.